Have you ever wanted to visit Whit's End? To sit down at the ice cream counter and tell your problems to Whit or just have a bowl of Raspberry Ripple Ice Cream? Well, we haven't yet figured out how to put Whit online and you can't yet order Whit's End ice cream through the net, but you can visit Whit's End online. 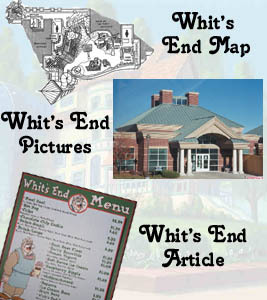 Click on the options to visit Whit's End in Colorado Springs. See the menu of Whit's End from the audio series. Get information about the Train Set.